While humankind has been documenting buildings in various ways since the beginning of civilization, architectural photography is a relatively new phenomenon. And it turns out that even the process of training the camera specifically on architecture has evolved—from using buildings as backdrops to making them the main subjects of striking imagery. © Berenice Abbott, Courtesy of Ron Kurtz and Howard Greenberg Gallery, New York. Long before cries of gentrification echoed throughout New York City, photographer Berenice Abbott was documenting the transformation of the city in her project Changing New York. She shot this photo of Manhattan's building boom from the top of the newly completed Empire State Building. Walker Evans was known for his work touring rural America for the Farm Security Administration. Along the way, he documented the way that Southern cities like Atlanta emerged from Great Depression to become new centers of industry and culture. In 1955 the French-Hungarian photographer accompanied modernist architect Le Corbusier to the Indian city of Chandigarh, where he had embarked upon an ambitious planned city. Hervé's images were often responsible for bringing the architect's work to a global audience. Julius Shulman has been called architecture's most notable photographer. Known for putting people in his photos at a time when many were void of all humans, his work introduced not just new modern buildings but a Southern California lifestyle to the world. Architecture runs through Ruscha's work, whether it's his paintings of gas stations or photographs of every building along busy LA streets. This aerial shot of Dodger Stadium just after it was completed, ringed with endless parking lots, was evidence that LA's transition to auto-centric city was complete. American photographer Stephen Shore became famous for embarking upon a road trip where he captured cities in color—not the black-and-white format so prized by his fellow artists. His celebration of the vernacular gained well-deserved recognition, turning banal landscapes into works of art. The German photographer is known for his streetscapes, which manage to capture a similar feeling of buildings repeating to infinity in cities from Rome to Tokyo to New York City. This particular stretch of homes, in London, seems to both celebrate classic architecture and also lament the cookie-cutter mentality urbanization. The architectural photography of Italian photographer Luigi Ghirri was unique in that although he captured absolutely real places with no manipulation, he would do so in a way that felt fantastical. These fantasy landscapes became striking statements of abstract art with their geometric forms and pops of color. The Swiss-French architectural photographer is responsible for documenting many high-profile architectural projects for architects like Daniel Libeskind and Zaha Hadid. Yet the way she experiments with light and space transforms these images of buildings into fine art. With his large-format cameras and extremely long exposures, Japanese photographer Hiroshi Sugimoto has managed to produce some of the most unique perspectives on the urban environment. In 1997, he couldn't have known how haunting this photo of the World Trade Center would become. The London-based photographer is as well-known for his portraiture as he is for his striking landscapes, which often capture people's daily lives. As a South African native, Guy Tillim has spent his career exploring and documenting African cites and, in recent years, the way they're changing. He was one of a handful of photographers who documented the apartheid era in South Africa, sharing this troubling time with the rest of the planet. The Dutch photographer Bas Princen went to architecture school, which is why he may be so fixated on not only the structures but the materials and operations which make them possible. Construction sites, work crews, and manipulated landscapes all make their way into Princen's focus. The German conceptual artists Bernd and Hilla Becher would photograph seemingly everyday buildings like this tower on the Belgian countryside. Yet the power of their work came when the photographs were organized into collections with dozens of similar buildings to show just how similar buildings were, all over the world. With a dramatic, almost romantic vision, Simon Norfolk manages to capture the effects of war—both the ruins left behind by military intervention or the new infrastructure like this security checkpoint that conflict makes necessary. The famed Dutch artist Iwan Baan was one of the first contemporary architectural photographers to train his camera back and give true urban context for the buildings he was capturing. Most notably his work has given a voice and face to marginalized communities in developing nations and the buildings they inhabit. 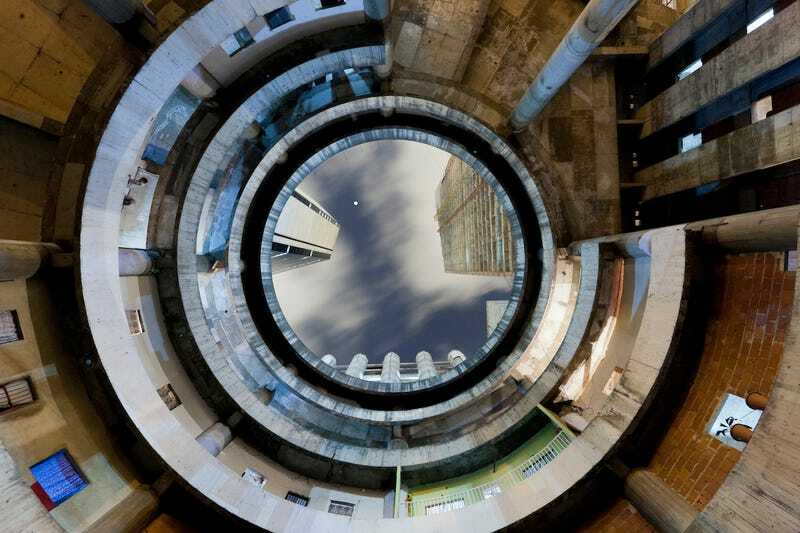 Top image: Iwan Baan, Torre David #2, 2011. Image courtesy of the artist and Perry Rubenstein Gallery, Los Angeles.